Kipper is looking after Pig’s cousin Arnold. He wonders which of his toys Arnold would most like to play with. But to Kipper’s surprise, Arnold is happy with just the toybox! A comical Kipper story for newcomers to reading, presented in a bright, chunky board book edition built to resist the wear and tear of little hands. Have fun colouring in and then playing with these Kipper and Arnold finger puppets. 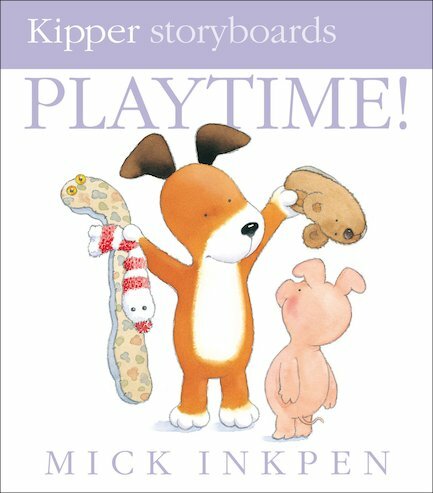 Fantastic ideas for Kipper-based games – perfect for parties! Can you guess which of Kipper’s friends is making which noise? It’s Kipper’s Birthday! Can you colour in the lovely balloons? Find ten seaside words in this Kipper puzzle. Pin the Tail on Kipper! Colour in Kipper and then play pin the tail on Kipper! I got this book out from the library and my son thought it was great. The story is nice for a child to listen too and the pictures show the story well. Mick Inkpen is an award-winning author and illustrator who is best known for his characters Kipper and Wibbly Pig. His books have sold millions of copies across the world. Mick won the Red House Children’s Book Award for Threadbear in 1991, and the Nestle Smarties Award for Kipper’s A-Z in 2001.